Starting up a new sales team here in Birmingham has been fun, enlightening, challenging, and a host of other adjectives that I can’t even begin to delineate. One of the things I’ve been going over with our new agents here is the idea of being a complete “Time Nazi”. One of my good friends passed along this blog post from Sales Benchmark Index and I thought it was worth passing along. What would happen to your income if you lost a month out of the sales year? Have you ever calculated the annual cost of allowing anyone to waste your time? Let’s say you manage to spend 60% of your time selling. Because certain admin work is unavoidable. Leaking just 20 minutes daily equates to a month of lost selling time. Below I discuss seven (7) ways to plug leaks. You will also find a free tool that will help you find the leaks. 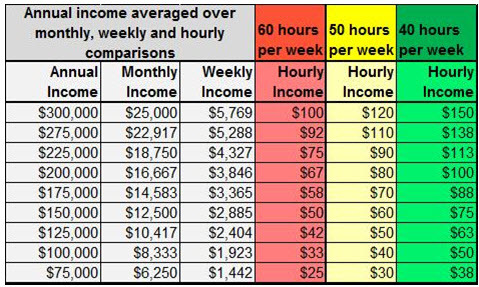 Check out this chart that shows your “hourly rate”. Giving up time you might use to make more sales is like paying more taxes. How Can You Minimize Time Leaks? It sounds so simple: Be ruthless with your time. But it’s challenging: Because it’s hard to diagnose the leaks. So take a series of snapshots of how you spend your time. To assist you, we’ve developed this time assessment tool. o Post-sales support ensures smooth implementation and repeat customers. o Don’t shortchange these sorts of activities. Invest five minutes for the next 10-20 business days. Activity tracking is dull, but it will pay big dividends. It isolates non-selling activities that take money out of your pocket. What Can You do to Create More Selling Time? Pay yourself first: Set a target for 75% of your time spent on revenue generating or selling activities. If you make your number, there will be high tolerance for imperfect process or paperwork. If you miss, no amount of admin excellence will substitute. Block prime calendar hours: Treat them as sacred. DO: Meet only to collaborate. DO: Start and end on time. DO: Insist on an agenda for every meeting. DO: Expect people to prepare. DON’T: Let Calendar programs make your meetings longer than you need. DON’T: Cover what people should have reviewed on their own. Delegate: Resist the temptation to “just do it myself.” Could you do it faster? Maybe. But delegate anyway, because a sales professional’s time is the scarcest commodity. Once you run out of you, you’re done. Re-allocate: One of our clients now covers more opportunities per rep. How? They moved CRM entry, forecast calls, training, and reports to non-prime selling hours. You can too. Cluster: Are you addicted to multi-tasking? It’s an illusion; it actually makes you less productive. The biggest time-sink is email. Limit yourself to two calendar blocks daily for email and other administrative tasks. What more can you do after you’ve streamlined everything you can. Share your time tracking data with management. It might help make the case for deploying more sales support. What can you do to make your number? Download our free Time Study Tool. And start being ruthless with your time.